“This mini-issue reflects on the month of revolt in the hospitality and platform work sectors. Workers at Uber/UberEats, Deliveroo, Wetherspoons, McDonalds and TGI Fridays have previously been organising, but in October they coordinated to strike on the same day. This is the first time that workers in the so-called “gig economy” have fought together with workers in the more-traditional service and hospitality sectors. For some of these groups of workers there are direct links, for example UberEats delivers food from McDonalds. Others are brought together through the experiences of low paid and precarious work, providing services that workers across the economy use – and increasingly rely upon. The Undercover Research Group and the Guardian have collaborated to produce a full guide to known spycops to date and their targets, giving a clearer picture of the extent of state harassment of political campaigners. The Campaign Opposing Police Surveillance have also published a guide to recent developments in the long fight against the police cover-up on this subject. There’s also a personal reflection from someone who was spied on by South Wales spycop Marco Jacobs as a fifteen-year-old here. For anyone in the Peterborough region wanting to act on this information, there’ll be demos against scumbag spycop-turned-tory-councillor Andy Coles on October 17th and December 12th. Meanwhile, End Deportations continue to produce regular updates on the Stansted 15 trial as it continues, which you can read here. 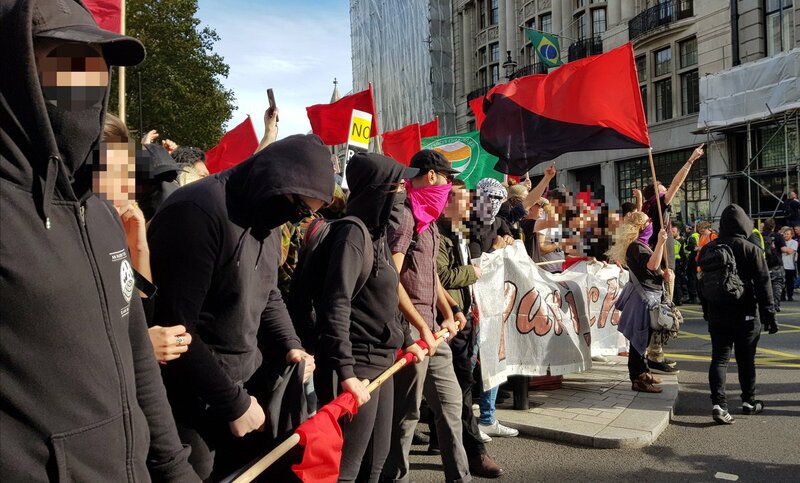 With the big counterdemo against the DFLA out of the way – and fairly successfully, by all accounts – other upcoming events in October include the “not the bookfair” festival this weekend and the “rise of the precarious workers” demo just before Halloween. Plan C have some further thoughts on what’s next for feminist antifascism here. Unite Community are also talking about a national day of action against Universal Credit in December, though not much seems to be confirmed yet. This entry was posted in Protests, Racism, Repression, The right, Unemployment/claimants and welfare and tagged anti-fascism, Campaign Opposing Police Surveillance, Notes From Below, Plan C, spycops, Stansted defendants, Undercover Research Group. Bookmark the permalink.